Welcome to another (late) weekly update. I am sure everyone will agree that yesterday’s big news from Yellowstone deserved a day to be digested. In case anyone did not realize (and many did not), yesterday was April Fool’s day and Albert served up a cracker of a story for everyone, which some (especially on Facebook), fell for hook, line and sinker. I am sure there are more comments hidden around the various Facebook shares of the article too. Starting with the quiet VAACs, London, Wellington and Montreal are the only quiet areas this week, although Montreal did have reports of ash from Pavlof, but this will be covered under the Anchorage reports. Etna ended the week with a couple of small eruptions. On the 31st, a small ash eruption was reported to 10000 feet, and on the 1st a similar report of ash to 15000 feet. As Carl said in his article last week, Pavlof had a Hekla moment erupting without any warning and catching everyone by surprise. An initial report by a pilot on the 28th of an eruption caused a VAA to be issued at 0100 UTC, this report showed a eruption of ash to 20000 feet, further reports throughout the day increased this height to 30000 feet, then 37000 and finally 40000 feet where it appears to have stayed steady until 0302 UTC on the 29th, when the report suggested that the plume had dropped in intensity to 25000 feet. The Event finally ended with a report on the 30th the 1021 UTC . Colima has had a busy week continuing it’s recent trend of short lived explosions of ash. The VAAC reports show that ash was sent up to around 17000 to 18000 feet mark, with a plume to 20000 feet reported on the 29th of March. A single event was reported at Cotopaxi on the 30th when a plume was reported up to 20000 feet. Returning to a busier state this week is El Popo. Daily activity was reported throughout the week with plumes ranging from 21000 feet all the way up to 30000 feet and incandescence reported visible on the webcams on the 28th. At Reventador, a “possible” ash emission was reported on the 31st to 30000 feet, no further information was available regarding source of this report, but given previous weeks reports I will assume this come from the local MWO. 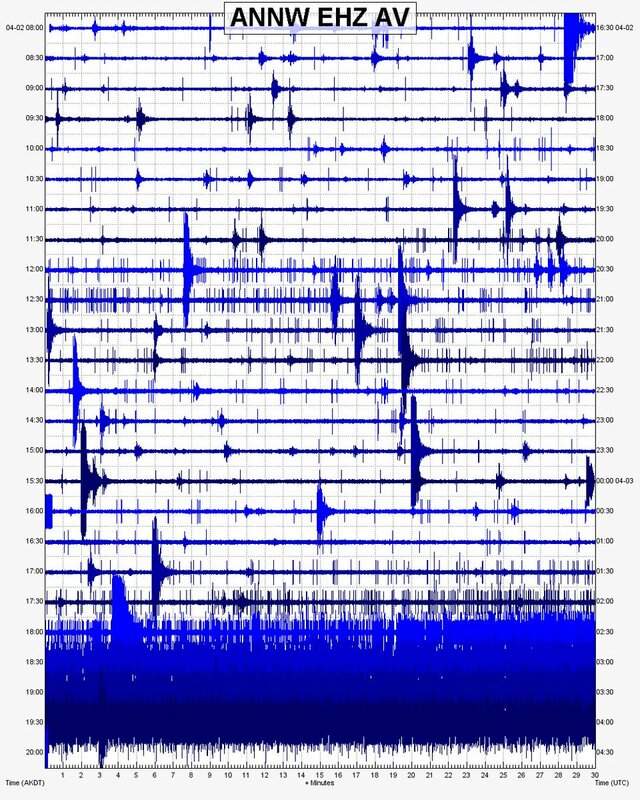 on the 29th, a “blip” on the seismographs suggested an eruption once more at Nevado Del Ruiz but due to bad weather and cloud cover, this was not visible on satellite nor webcam footage. However on the 30th, a plume was reported and corroborated to 30000 feet. The local Meteorological Watch Office reported a continuation to last weeks eruptions with ash reported to 25000 feet on the 27th and a further eruption reported on the 28th, however no further data was given for this particular event. A brief return into the report with a single event for Santa Maria de Guatemala with ash reported to 17000 feet on the 29th of March. 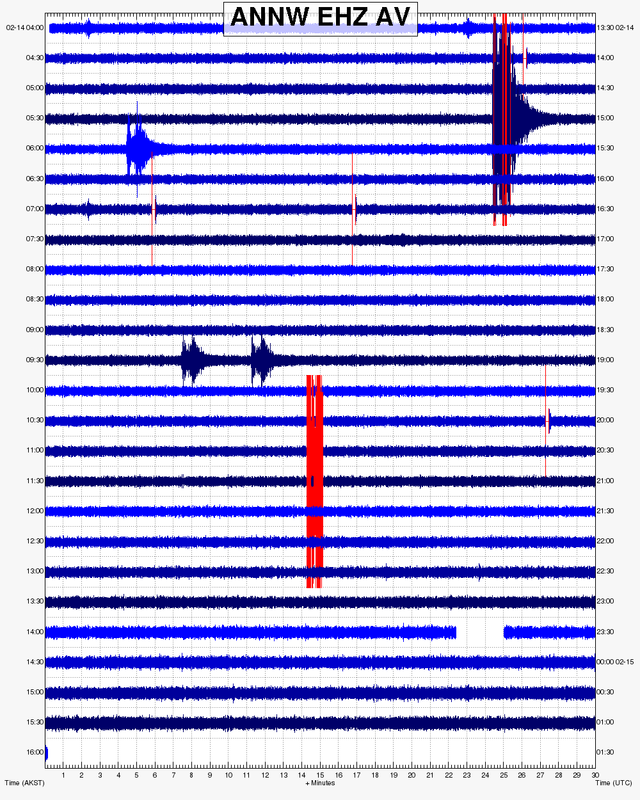 A possible new eruption was reported on the 31st from Tungurahua, with the seismograph suggesting some activity but the visible sources were unable to corroborate due to cloud cover. Dukono continues to produce a steady plume to 7000 feet every day. Sinabung also continues with her recent trend in activity with eruptions and pyroclastic flows reported throughout the week, with plumes reaching 11000-14000 feet mark. Quietly sneaking into this weeks report is Indonesia’s largest volcano, Mount Kerinci. Reports from CVGHM show that starting on the 30th and continuing on the 31st and 1st, Kerinci sent ash up to 16000 feet. A short single report from the 1st shows an event on the 1st of April throwing ash up to 10000 feet. Switching VAACs, we find that the Kuril Island volcano of Alaid continues its recent activity, with “possible” eruptions reported on the 30th and 31st of March sending ash to 10000 feet. Slightly further sound than her sister volcano of Alaid, sits Chirkurachki in the Kuril Islands. Starting on the 29th and continuing on the 30th and 31st Chirkurachki sent plumes up to a similar level as her sister. you can see how close these two volcanoes are in CultureVolcan’s tweet above. On the 29th in the Philippines, a report from Phivolcs and the Himawari-8 satellite picked up an eruption of material to 10000 feet. March ended on a spectacular note for Sakurajima. A large explosion was reported on the 26th sending ash up to 9000 feet, followed by a more usual 5000 to 8000 feet eruptions on the 27th and 28th. Then on the 31st we had a bigger explosion than has been recently reported sending ash up to 10000 feet, it appears that against its pattern normal short lived plumes, this event continued into the 1st of April with “continuous” ash reported and further larger explosions raising this ash to 14000 and 15000 feet. Heading back to Russia, Sheveluch has had a number of events over the past week. Starting on the 28th we had reports of 3 seperate events sending ash up to 14000, 12000 and 13000 feet. The volcano the had a rest on the 29th, before bursting back into life on the 30th with a plume to 14000 feet, 20000 feet on the 31st, before dropping back down to 14000 feet on the 1st of April. Rounding up to Tokyo reports is a single report of activity on the 30th from Suwanosejima, with an eruption reported to send a plume to 6000 feet. Finally rounding off our report is a report of activity at Sabacaya, where a pilot sent in a report of ash, but webcam feed and satellite data appear inconclusive. No other data on potential ash levels. I will finish off this weeks round up by asking a question of the readers. In a conversation between Carl, Henrik and myself, Carl and Henrik suggested that they have a problem with current format causing the comments box to jump around and generally have a fit when their computers load the page. Personally, I dont have this issue, but I suspect that it is due to me having all the images and links in my cache and therefore loading quicker. I also suspect that because most of the images are hosted on Twitter and Facebook, there maybe a delay in the cross-loading from these servers. So to my question, is this an issue for everyone? If this is a problem, I will make changes to the setup so that I am not posting a direct link to the content, instead I will grab a screenshot of the tweets and posts and provide a link to the source. I will also look into other options because I will freely admit doing it the current way is very simple and changing to a screenshot/link setup will significantly add to the time this take to write. It may seem fairly easy, but this is actually very time consuming, I estimate that this weeks report has taken me around 5 to 6 hours to compile and write, and the proposed change might add up to an hour to this. As ever I welcome your comments/suggestions and criticisms and I look forward to reading them all. Still doing the upwards bounce on the comments. I think it is the links to twitter that does it. I also have the bounce. When say you click on a comment, it goes there, but almost immediately jumps some distance up. A nuisance, not a problem. It seems to have to do with rescaling inside the browser as it accommodates the images: it may well be browser dependent. Thanks again for your weekly rouhnd-up of news Hobbes; also I’ll mention that I’ve never had a problem with comment posts jumping around. By the way, was that was an interesting ‘quake at 16.55 near Habunga at 13.8km deep? Considering the deeper earthquakes earlier, I mean. The “bouncing” is due to content loading in and causing a page reflow (repaint) when the browser re writes the page to incorporate the updated graphics. Using a static image would help only in causing the graphical content to show up at the client’s browser at about the same time. That might cut back on browser re writes of the page. The chaps who got upset by the Yellowstone article may have read it on 31 March, given the time difference, especially if they were on the west coast. I always read this blog on my cell ( Iphone). Sometimes it “jumps”, but always only one time. I don’t have any issue with that, I just really appreciate the effort of your post! Thanx again!! Looks much better now. A few hours ago it was all margins and almost no text on my android phone, but that little issue seems to be solved now. Works like charm again!! Well done! Aniakchak Webicorders have seem to have gone a bit wild in the last hour. Went from the popping we saw earlier to what looks like a very intense tremor or something similar. Here is the other webicorder page which like the one above should update itself on the images so what you see on the blog is the most up to date image. Worth noting – this is localized to Aniakchak area. The other quakes were showing up regionally on other webicorders. 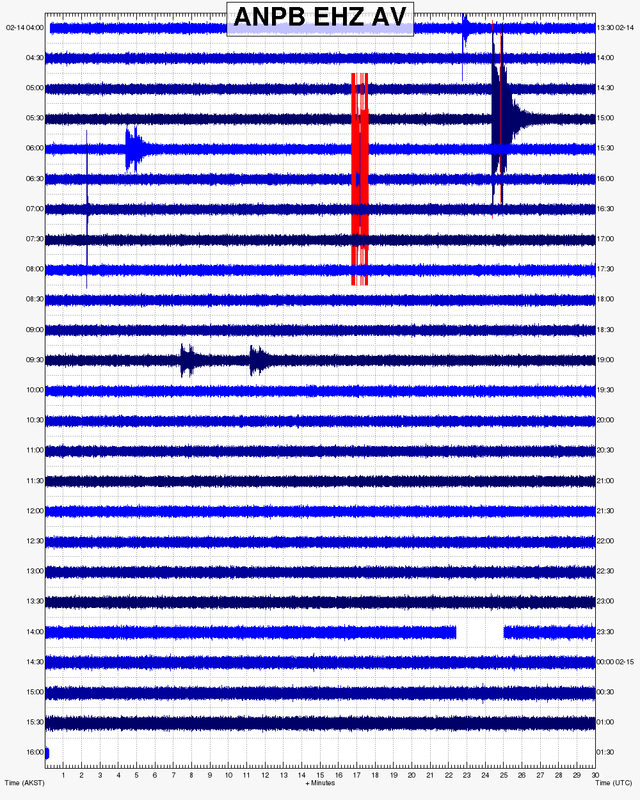 This tremor is only showing on the Aniakchak registers. (NOT self-updating AFAIK; static archived images; you have to use the site tools). See my reply below; it’s definitely tremor; I’ve spoken to a local who has *felt* it. There was a 3.2 quake about an hour ago and probably smaller ones,maybe that’s what they are feeling.Volcanic tremor?that does seem doubtful,if it was bad enough to feel, that drum plot would basically blacked out with signal,would it not? OK what the @#$@ are you talking about? I got in touch with a member of the village council. They told me they hadn’t seen anything at the volcano but they had been feeling “tremors” today. Now you can call me a liar or you can call them a liar if you like – but I would start by assuming we’re telling the truth. All we can say is there has been felt seismicity. Calm down ,we know they would be feeling something there is an obvious earthquake swarm occurring,but is that continously felt tremor, tremor due to volcanic activity,or just the earthquakes and if so, has a bulletin not been put out? Ian, may I suggest not writing like this. Leave the Moderation to the Admins. Yes Ian – I grabbed an image of that. Rescaling is clear. BTW has someone been buggering around with the logins? I can no longer login with Twitter or FB; those options don’t appear. We have an issue with Jetpack and that might be the reason. Well I put out a request for information to the good people of Port Heiden village and someone got back to me. They haven’t seen anything or had any ashfall (apart from earlier from Pavlof) but they’re definitely feeling that seismicity we see on the drums. So it’s not weather or equipment. This might become a really good conundrum since it is so far away. It might come in useful to have a village councilor to ask now and then if needs be. If volcanic,it looks like it would be forming a new vent,there is kind of a vague circular cluster to most of the quakes,but are they close enough to Aniakchak,to be related to that caldera?A link I posted earlier suggested the shallow magma in the caldera to be at a depth of around 4km. AVO page for Aniakchak,still at green? These are all of the recorded quakes, going back to 1963, in the area. This swarm is running the edge of the boundary for sure. Can anyone shed light on what makes the boundary so clearly defined? There are no quakes on the northern side. I looked in the USGS earthquake viewer after seeing this. I’m not sure what you mean by boundary. I do not see any clearly defined boundaries. What I did however notice was that there was another small shallow swarm slightly to the east of the current activity in 2012. What strikes me as interesting is how little earthquake activity has occurred within Aniakchak itself. cbus05,do you think this could even be considered a swarm,as the quakes seem well spread?It seems to be just an aftershock sequence to a 6.0 magnitude quake ,whereas a swarm would mainly be a cluster of numerous smaller quakes at similar depths? Why do you doubt a swarm? usgs only shows 2.5+ quakes. I see 10+ quakes/hour on the webicorders untill the tremor started. But usgs don’t list them and have no location or depth for them. All the percursers quakes for the holuraun eruption show the history and the prediction.. The big ones 3+ at bardabunga made no prediction at all about the final eruption location. It’s the tiny ones that did. And here we don’t have any data about the little ones due to lack of instruments. No clue, much of this depends how you define a “swarm”, which isn’t really an official term, but rather just a general term to refer to a cluster of earthquakes. I do know EMSC and USGS seem to vary a bit in where the quakes are mapped, so what may look to be spread out a bit, may actually be a bit closer in reality. Of course, the opposite could also be true. If your question is “are these quakes volcanic”, I have no idea, and “probably not” is the best answer I would personally speculate. However, it’s important to realize that in many instances, tectonics and volcanics are closely related and often, one causes the other. There are a lot of odd things with this event as I see it. I’ll try to list them in bullet point form below for speculation purposes. 1. This is a large earthquake that occurs at an odd location. Normally, large earthquakes in regions like this occur either on the subduction plane, or on a transverse fault. These quakes are way too shallow to be subduction oriented. If you research historical quakes in the area, most of the quakes before the last few years are very deep. Most arc volcanoes tend to form in a region where the subducted slab is approximately 100-120km deep, which is the approximate location of most of these deep quakes in the area. As for transverse faulting, there isn’t much evidence for this in the area – if there were a decent sized transverse fault, I would imagine USGS would know about it, but I see nothing on it, and there are no visible fault lines or quake history to indicate this being the case. 2. It’s for this reason I was speculating that the quakes here are extensional in nature. 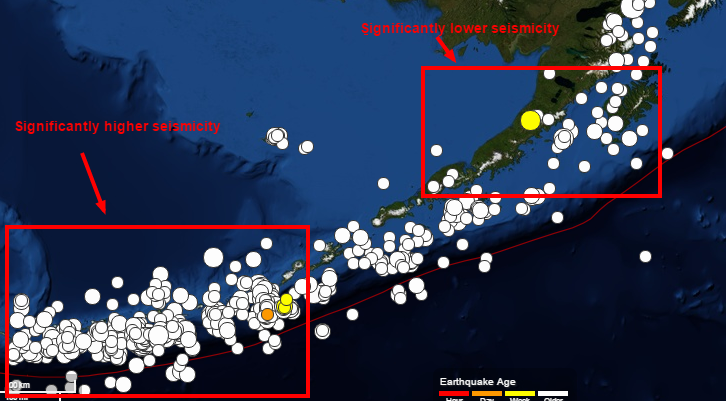 It’s not uncommon for prolific volcanic arcs (especially those that have particularly fast subducting slabs like the Aleutians) to see some crustal extension. Normally, this occurs in the back-arc, but sometimes it can be right on top of the primary volcanic arc. The beach balls seem to show that these are in fact extensional in nature (I believe, i’m not the best with beach balls admittedly). 3. What looks to be intense tremor appeared at Aniakchak not too long after the primary quakes (in which there is still some shaking occurring). This tremor appears on more than 1 webicorder, which leaves doubts to it being a malfunction, or a human cause. It’s known that large quakes can cause unrest in magma chambers, and considering the unusual proximity here of such a large earthquake to a large volcano’s magmatic system, it’s likely that the earthquake caused some unrest. I would speculate that shaking can possibly cause unrest and exsolution of gasses in magma chambers if close enough. Alternatively, it could potentially open up conduits and pathways, resulting in renewed mixing of magma. Given, most quakes do not directly affect volcanoes, but there is some evidence they do, and given the unusual proximity in this instance, I would not be surprised if there was an affect here that is causing the current tremor. Will this cause a volcanic event? Who knows. BTW, I’m not a geologist, volcanologist, or expert. This is just my personal thoughts and musings. For the record, I agree with these musings (other than the focal mechanism). However, I am also not a geologist, volcanologist either, though I do have an interest and read quite a bit. Here is a definition of a swarm,where all the quakes are in a similar size range,this sequence started with a relatively large quake,a 6.0 and so maybe this is an aftershock sequence? It’s fairly obvious that it’s an aftershock sequence of sorts. A “swarm” of aftershocks if you will. I’m not big on arguing semantics, and the definitions aren’t particularly important here anyway – call it whatever you want, it’s still the same thing. Regardless of how you describe the nature of these earthquakes, the point is that they have some oddities and things that make them interesting. I see a line where the quakes do not cross as shown below. Is this a result of the line of volcanism relieving the stress? That is roughly where the subducting plate let go of the upper plate. Aniakchak is anomalous since it is located behind the regular chain of volcanoes along the plate. Another in regards of the earthquakes that did not show on your plots. These earthquakes are far more shallow than they usually are here. Most earthquakes this far back are deeper than 80km. Is this up to date information? There is more than 1 webicorder at Aniakchak. Use this map to find them. A few are down at Aniakchak, but there are others that are operational that are just outside the caldera. All but 1 of the stations at Aniakchak is currently operational CBUS. And to add info to Carl’s 18:52. Generally, the melt generation zone for a subducting slab is right about the 110 to 120 km depth zone. There is a good possibility that the specific chemistry and temp/pressure ranges is not exact for this phenomena and you could see excursions from that rule of thumb. Variations in the subducted slab geometry could make it “pleat” as it goes down, this is mostly a function of a shrinking radius to accommodate the volume of the down going slab. Sort of the same reason for arc volcanism to assume a semicircle shape on the surface. As for the moment tensor for the M 6.2, it does indicate reverse faulting. Though it’s quite shallow and not on the main subduction fault plane. My GUESS is that it’s associated with stacking the material in the acretionary prism. This was a quake up in the bulldozed material in front of the dozer blade. Volcanic activity? Well, if an existing magma chamber chamber gets squeezed like a tube of toothpaste… maybe. But it would have to already have some amount of accumulated melt. And the USGS guide to how to read their beachballs. Side note. Local News indicates that Panama City is gonna revamp their stricter alcohol laws. It seems that businesses in that area are reporting anywhere from 50% to 80% loss in business this season over previous years. And if I remember correctly, the Amnesia late night club managed to get the Tax Exempt status lost for it’s affiliated church. Ostensibly, it was supposed to be a youth out-reach program. But with Naked Paint parties and such, it was difficult for them to maintain that they were spreading gospel. Gravitational effects of the moon affect Core cooling and geological activity on earth? Not as simple as tidal waves however…. Could there be a long term cyclic effect? Looking into some of the earthquake history of the Aleutians of magnitude 4.5+ quakes, I found something interesting. At least since 2010, the western side of the chain is significantly more active from a seismic perspective than the eastern portion. The region in which Aniakchak and the current activity seems comparatively aseismic. Not trying to interpret this, or assign meaning to it, just figured it somewhat interesting. I think it may have to do with the rather spiffing earthquake that the now seismically reduced area suffered on good friday in ’64. The length of the rupture stopped about where the seismicity increases. Makes sense – seems the western edge isn’t quite as locked up either. Carl, what are your thoughts on this stuff regarding Aniakchak? Is this tremor? I am currently waiting for answers from the AVO and AEC on this swarm. There are things that are iffy with the initial M6.2 that I would like to have answers to before writing the article upon Aniakchak. May well be that we repost the old one in the morning and a new one in the evening. But, gut feeling is that there are things on the move. But, that is a feeling. Is it not simply northward bending towards the oddest bit of the world, where the aleutian and kruril thrences meet at kamchatka? And the emperor seamounts get subducted..Fascinating bit of this planet. Dit not check beachballs or anything. That corner just looks really amazing on google earth. This corner of the world IS quite amazing, and quite fascinating geologically. In my opinion, the Kurile and Kamchatka volcanic arc are likely the most active volcanic arcs in the world. Technically, Indonesia is more active, but it’s also significantly larger, which makes a big difference. I hope to have an article up about Aniakchak sometime tomorrow. But it needs a bit of input from local scientific sources, so it may take a while to write. Thanks for the Friday update! Another excellent serving of fascinating information. As for pages jumping? I’ve been OK with it. I’m just looking in on Port Heiden and it rather looks like a good cumulonimbus is over the volcanic area, though it is very hard to tell on a ‘flat’ camera picture. Interesting range of activity going on there. Thanks for all your observations! That said, the Met readings don’t support the thunderstorm! Lol. Good Morning all. Bardy is restless. Not verified yet but a large 4 …ish tremor this morning. not too long ago! Looking at the plots of latest tremours something is afoot again there. I get it, after posting-I’m back on top of page, different problem. I have reposted the original Aniakchak article.